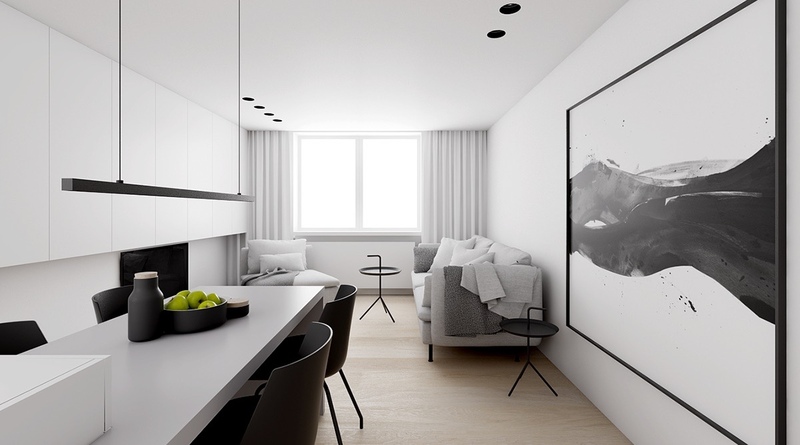 Monochrome is a trend that is here to stay. 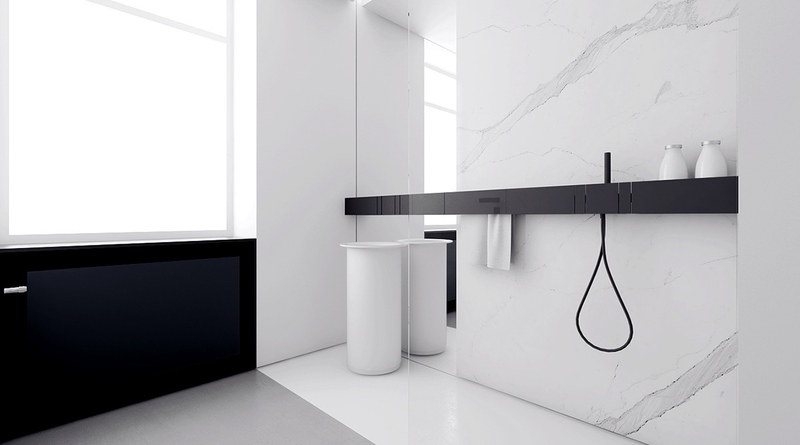 Equal parts classic and classy, its edgy tones have won fans across all spaces of interior design. 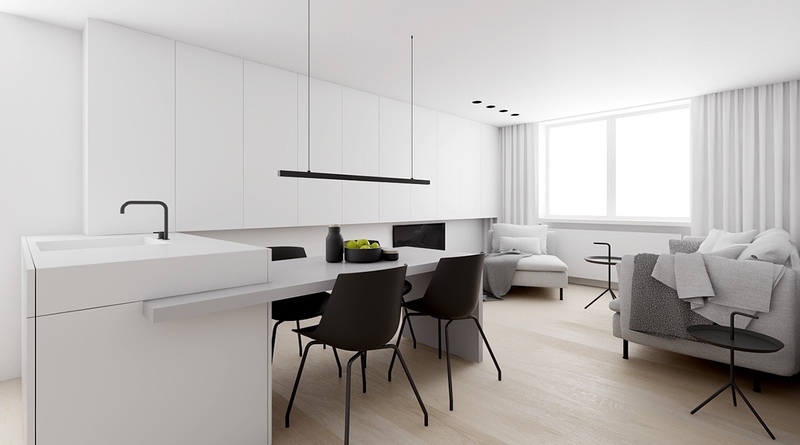 Similarly, minimalist interiors have enjoyed fervent favour over the last ten years. What do you get when you combine the two? 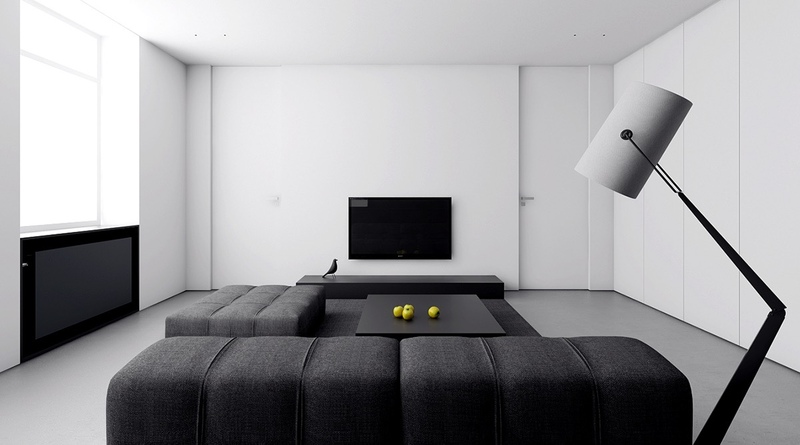 Minimalist, monochromatic living spaces. 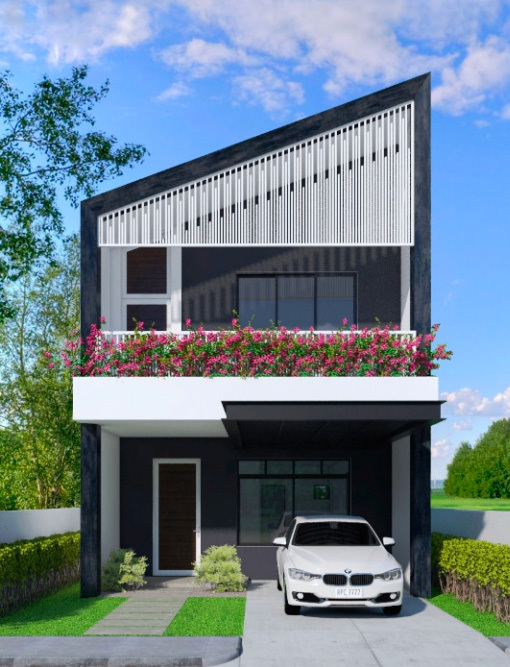 These four homes put the magic into homes that offer very little colour. Whether dramatic and full of impact, or more muted and everyday, these spaces proffer fresh thinking in familiar territories. 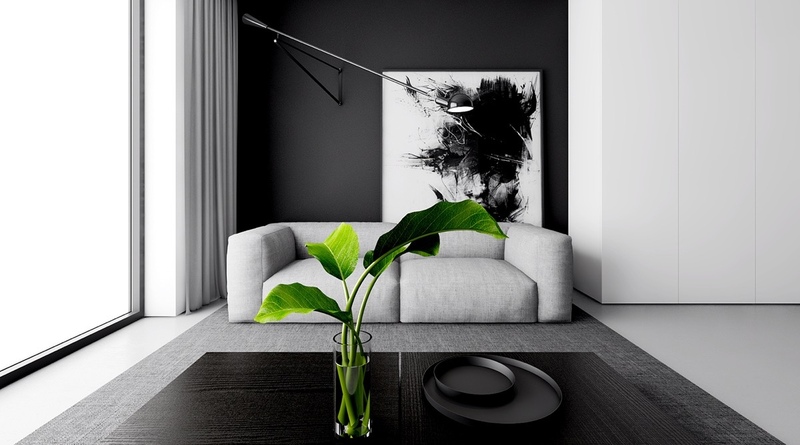 Are you thinking of designing your interior in black and white? 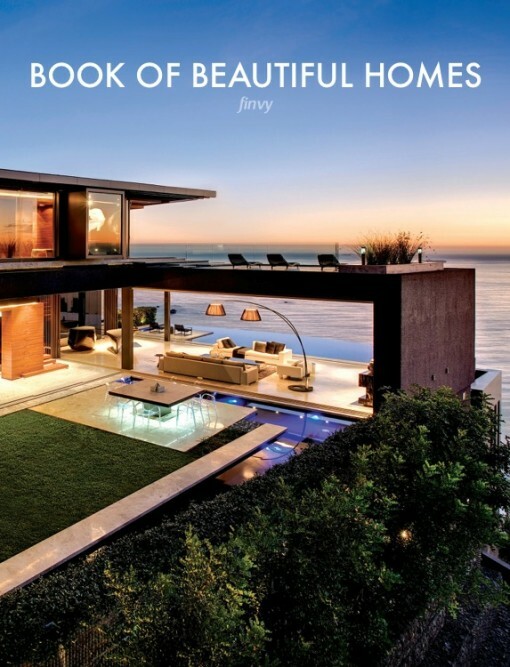 Take a gander to inspire your home decor. 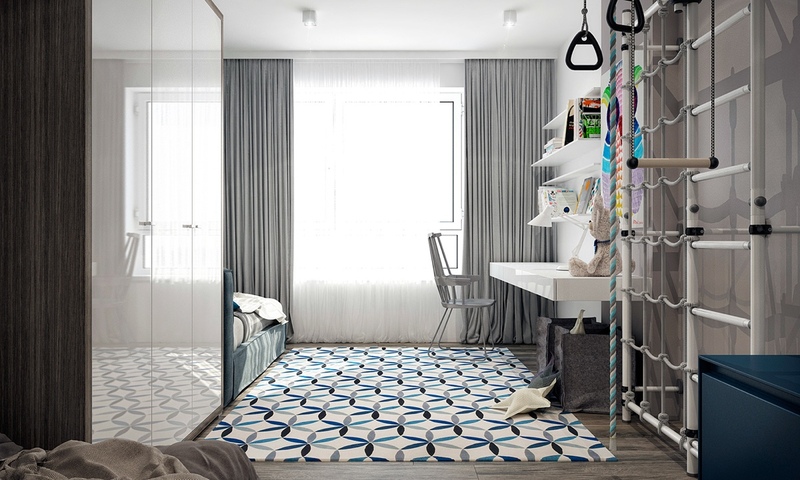 Our first space is a dash of boldness in large-format, large-impact monochromes. 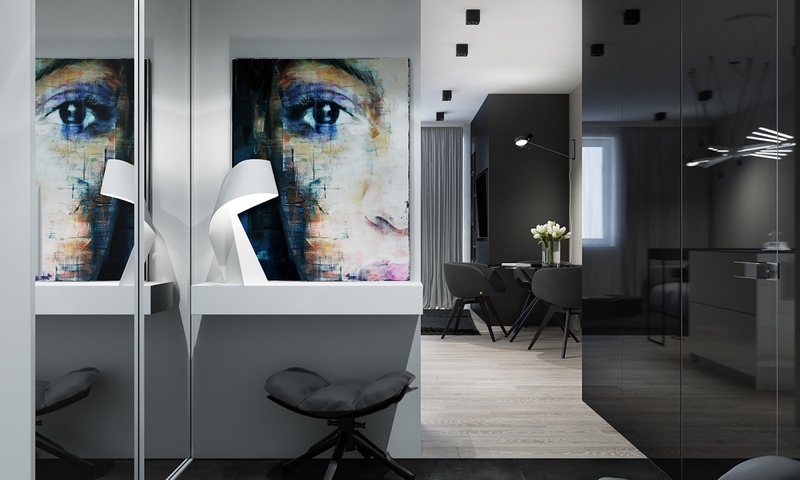 Based in Łódź, Poland, clean lines and colour blocking make for a dramatic entrance. 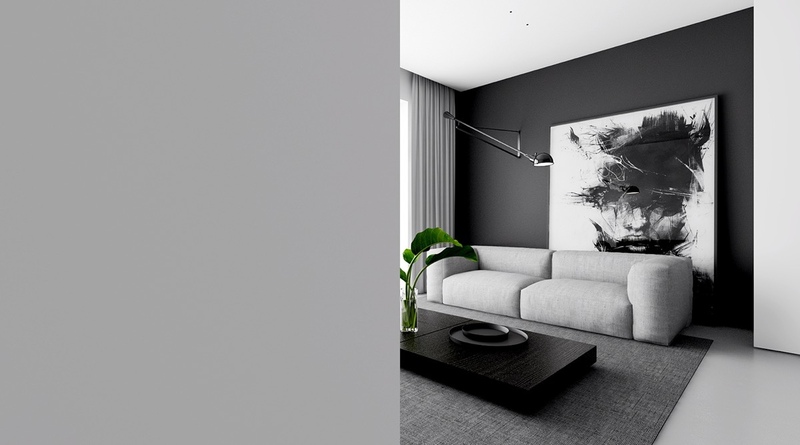 In the living room, a black wall stands proudly, as a low grey couch and painted canvas foreground. 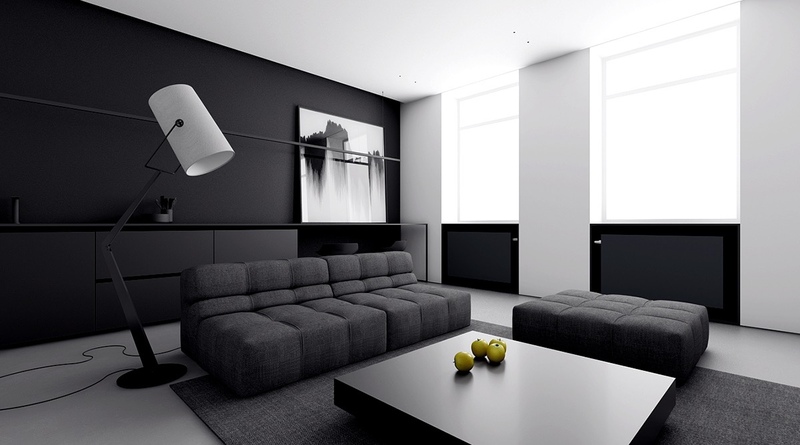 A black polished table mirrors the wall, a grey rug the couch. Vase-bound palm leaves add a touch of green. 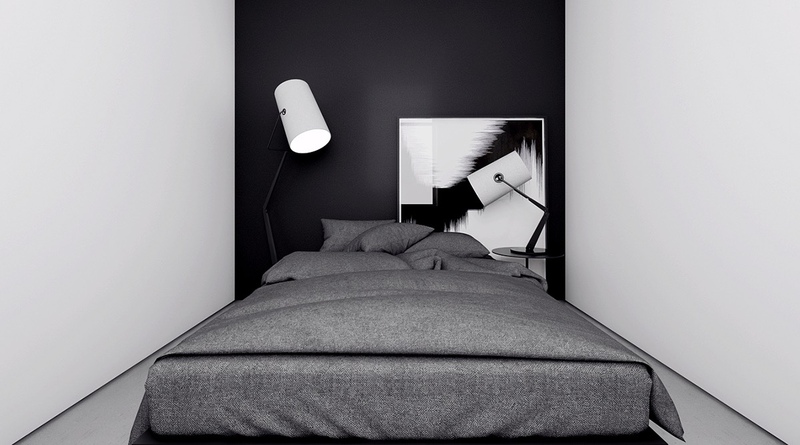 The swing arm wall lamp you see here is the Flos Mod 265. 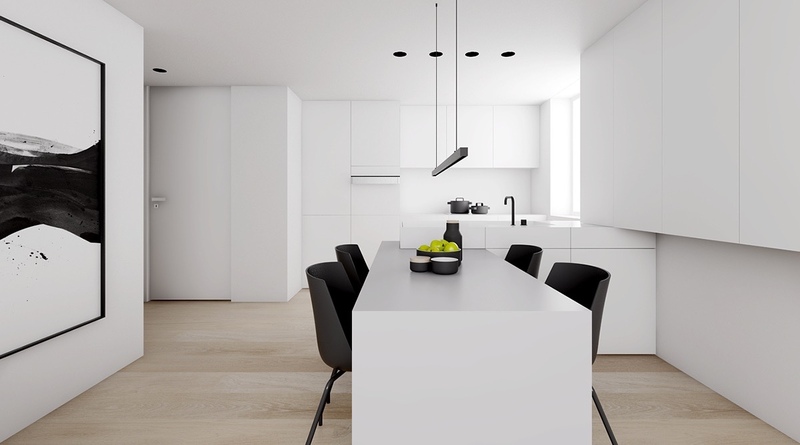 White lounge walls follow through to an all-white kitchen, speckled with black. 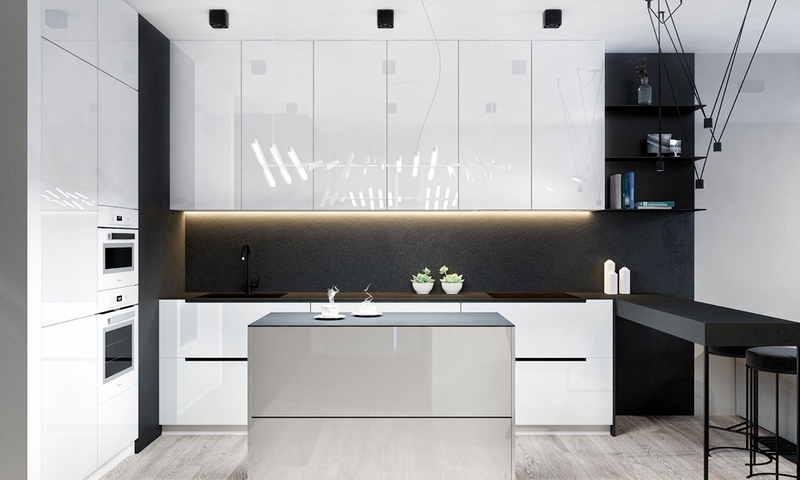 Floor-to-ceiling cabinetry stands tall in thin, sleek lines, following the minimalist route. 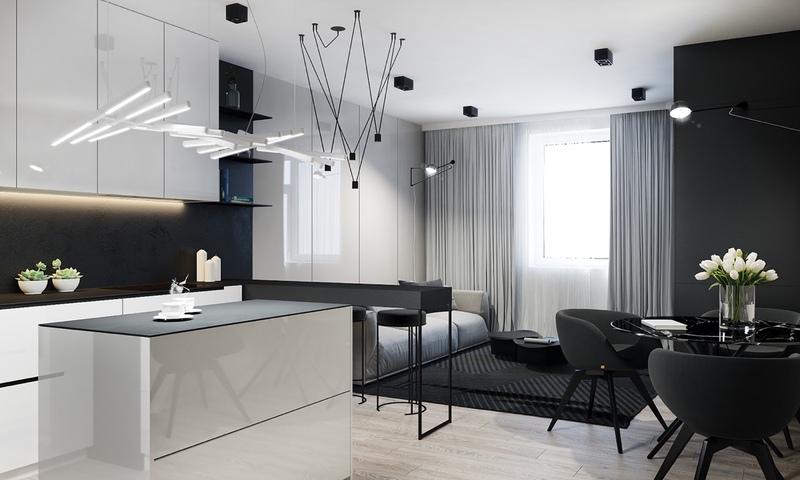 Thin hanging lights dangle above the kitchen bench, culminating in a three-pronged design. 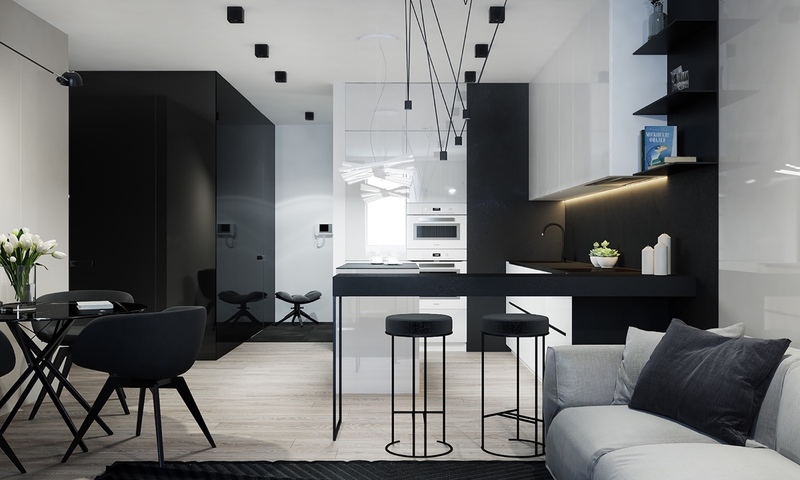 A black stove, stools, and fixtures add pops of black. Grey paves the road between. 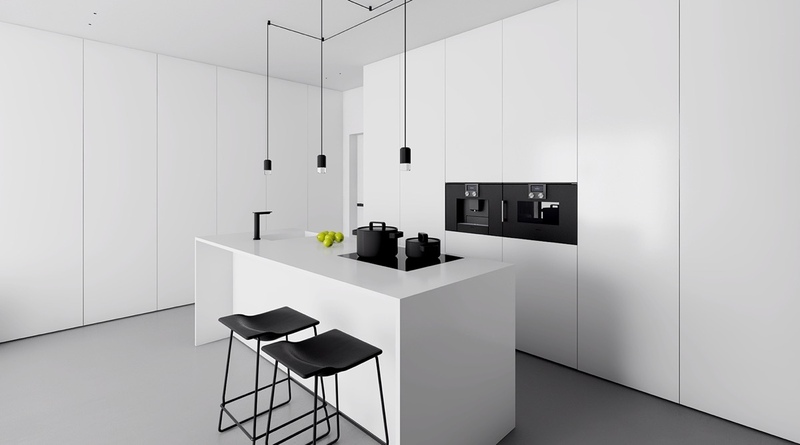 If you are specifically looking for black and white kitchen inspiration, do check out our: 40 black and white kitchens post. Our second space, also in Łódź, measures a mere 50sqm. 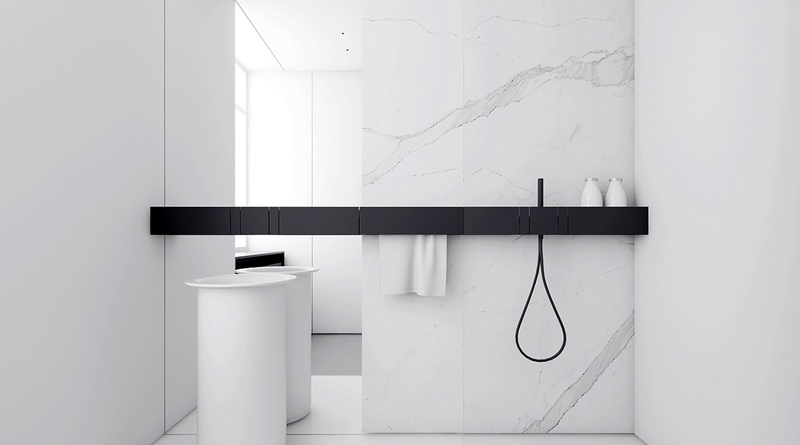 Created to fulfil a minimalist and Italian design brief, its greyscale and concrete refer to the post-industrial character of the area. 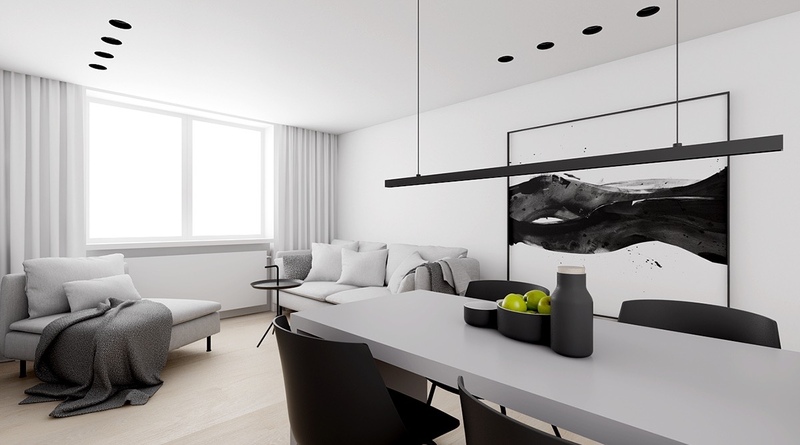 Doubling as one space, the kitchen and living room bounce with a shocking black wall, framed by a white ceiling and walls. 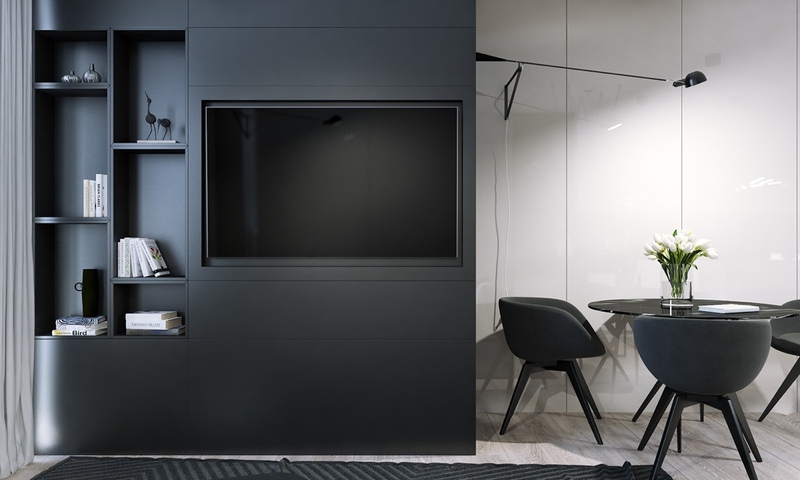 On closer inspection, the black wall’s steel hides a kitchen in lacquered black. 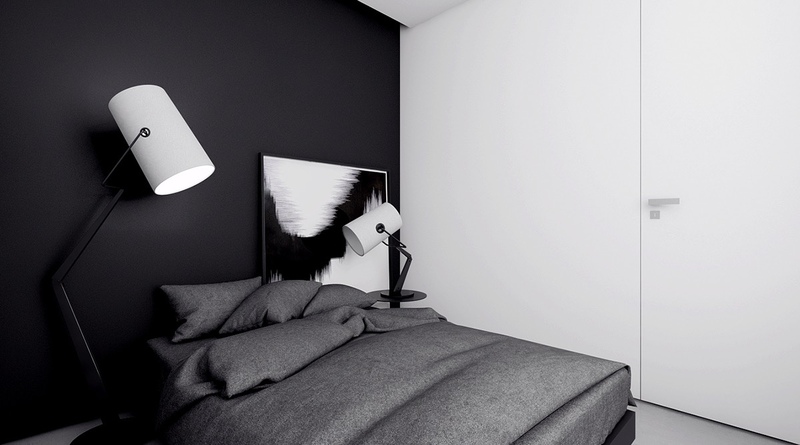 An abstract monochromatic piece deters the eye. 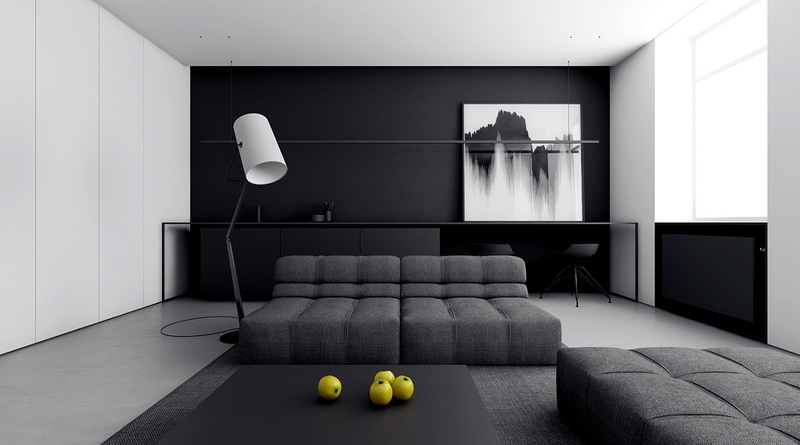 Towards the lounge, charcoal futon couches surround a low black table, offering apples. A black-and-white cameraman light sees window panels revert from white, to black, to white again. A TV hangs on an opposing wall in an oblong. 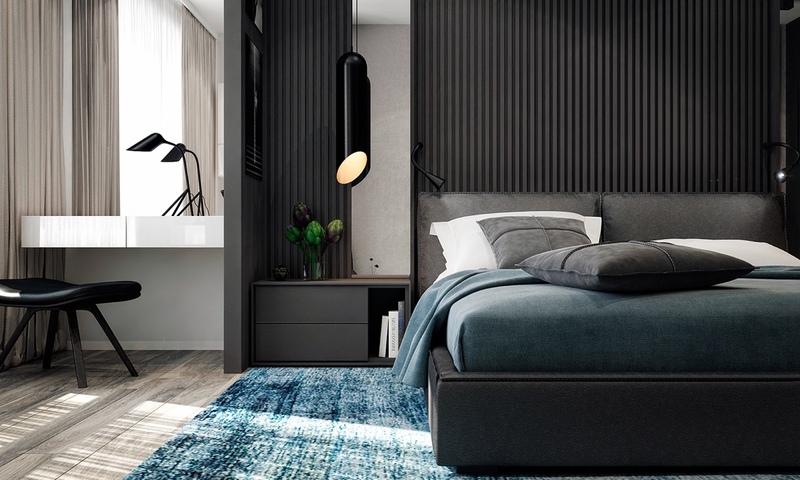 Carrying the theme, the bedroom creates a tunnel effect with a black gloss feature wall, with abstract monochrome peeping. Another cameraman light simultaneously blends in and stands out from the black and white walls. 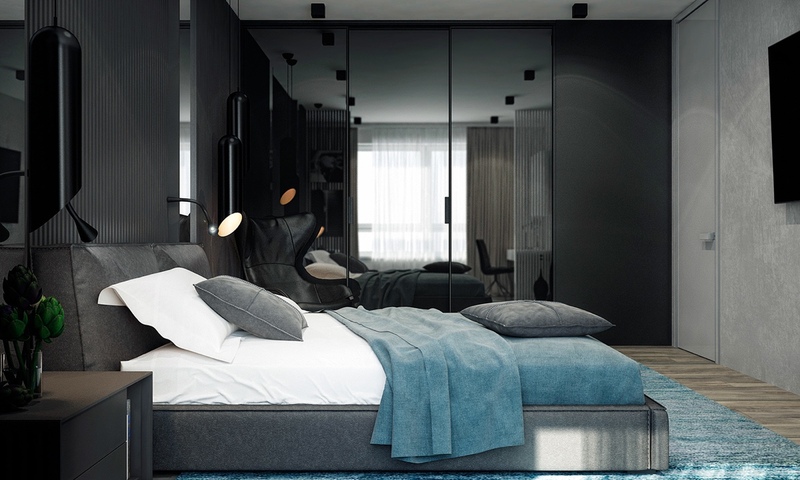 A grey futon-style bed creates harmony between the two. 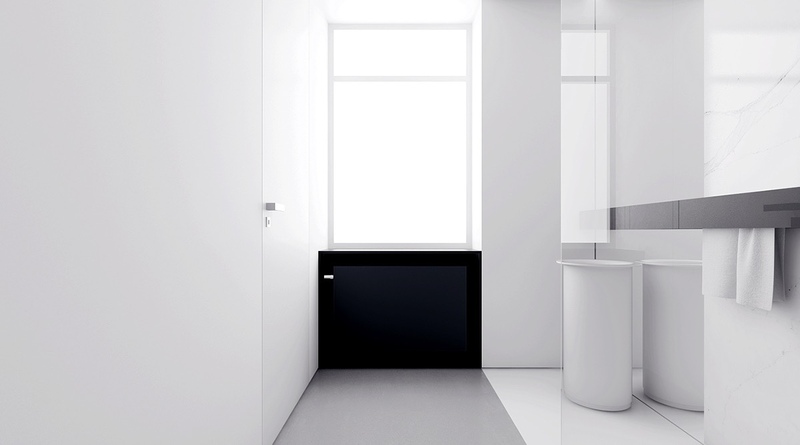 An almost all-white bathroom with shocking stripes of black keeps the minimalist theme. 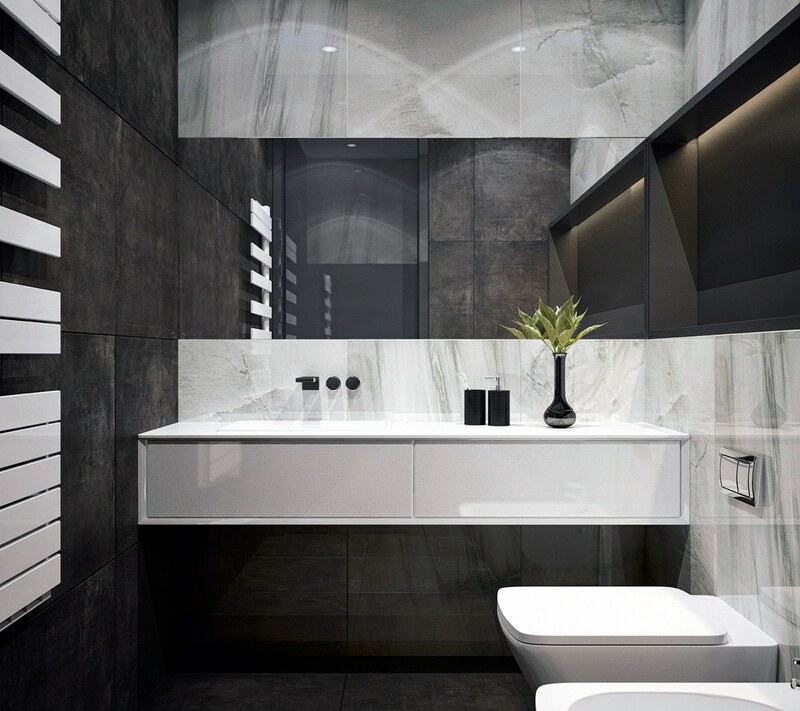 A black cabinet and shelf stretch across lightly-marbled walls. Wide, open-paned windows show a lighter version of white. 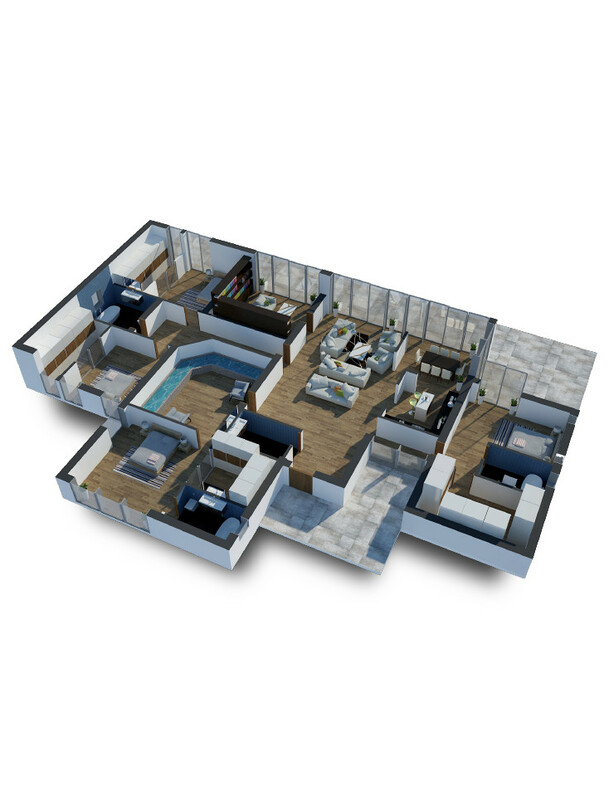 Our next space in Stockholm, Sweden, is a little larger at 59sqm. 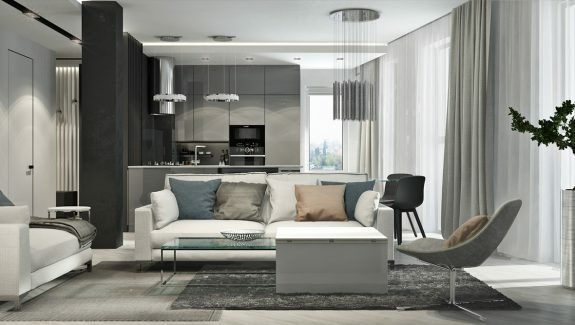 Using one large room to house a kitchen, dining and lounge area, its monochromes create a relaxed feel with shades of grey. In the lounge, white curtains open to reveal white walls and a wooden floor, the perfect minimalist backdrop. Making their mark, black stencil lighting, wall lights, a TV and feature art piece add life to the space. 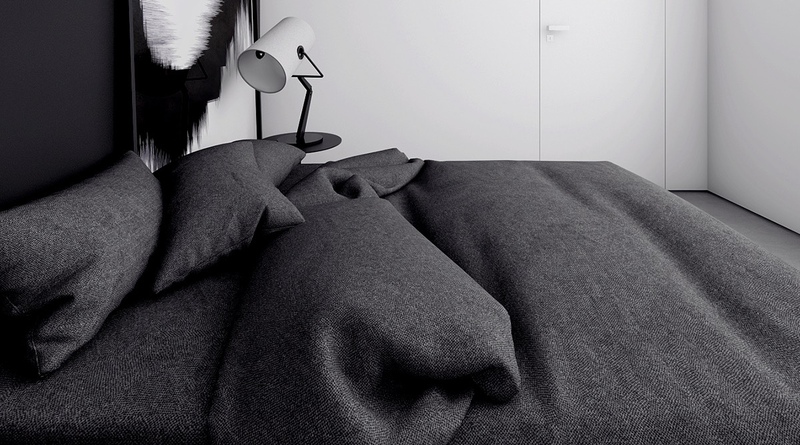 Supporting elements in grey throws, side tables and couches add softness, while black accessories tie in the theme. Towards the kitchen, a long bench alternating white, grey, white bends around a corner. Lit by a drop stencil light, black chairs reinforce drama. 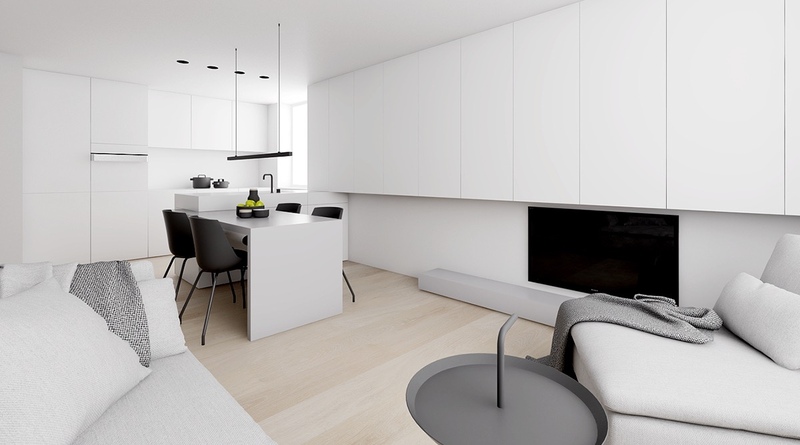 Minimalist white cabinetry and entranceway contours see the bench blend into the walls, making the chairs more striking. Our final space adds more complexity to monochromes, with dashes of colour added. 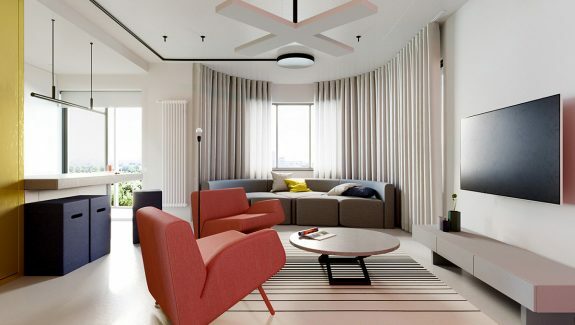 Spanning several rooms, its hues are helped by light grey and charcoal shading, especially in big bursts of colour. 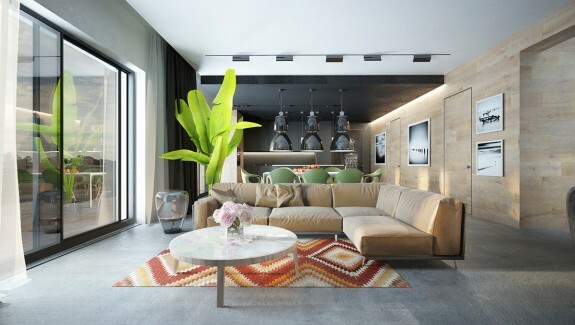 The lounge welcomes in light grey panels, flowing through to a matching couch, charcoal cushions and a rug. 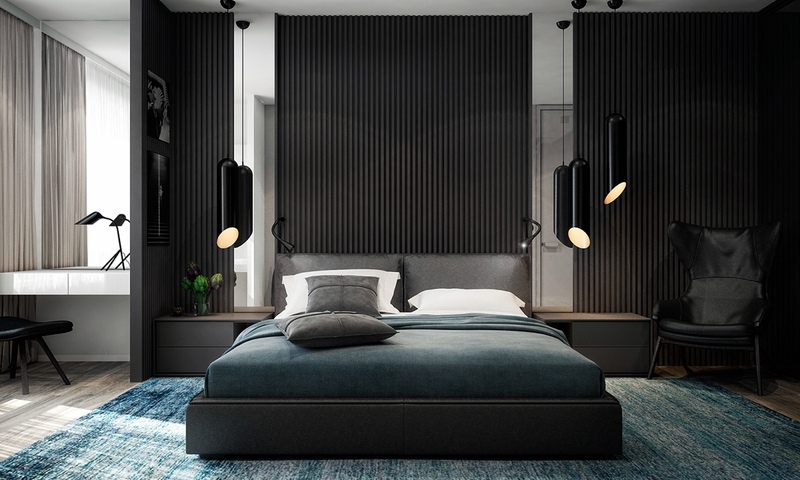 Light chiffon and grey curtains complement a multitude of lights, which criss-cross and dart one another. 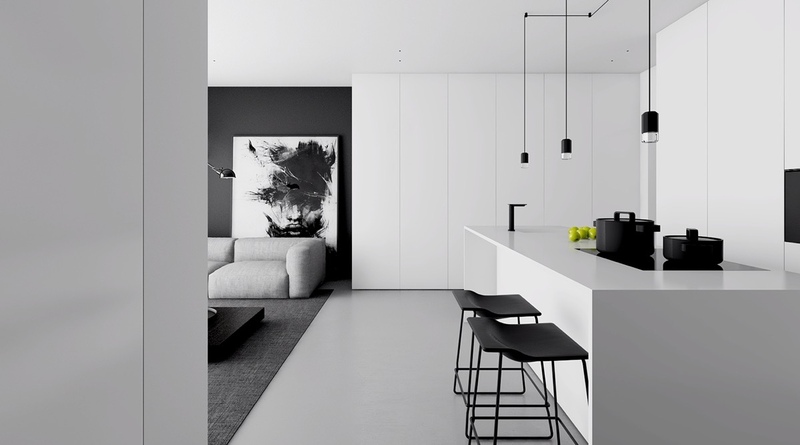 Large black cabinetry and white lacquered walls highlight colour contrasts on a light wooden floor. Block monochromes mark out spaces. The dining room is black, with a round table and pod chairs creating its zone. A bookcase notes to the side, while white tulips add nature. The kitchen shows a lighter, brighter side. 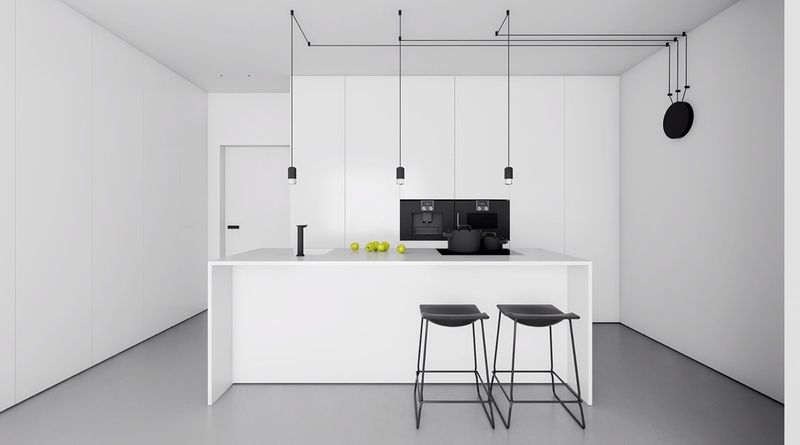 Clad in lacquered white cabinetry and a grey-hued bench, white rod lighting dangles above heads in the main area. 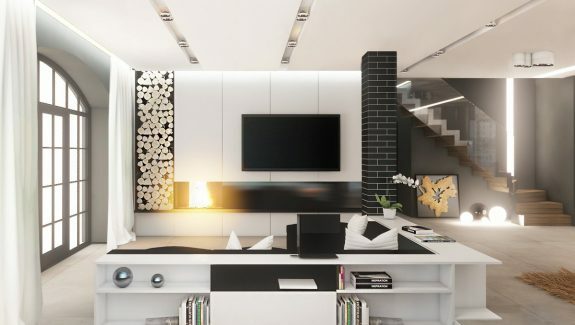 Appliances match and blend in with the walls, as LED lighting highlights a black inlet. Stepping away from the room, a multi-coloured face appears. A white ruffle lamp sits beside, wedged between a mirror and black lacquered wall. 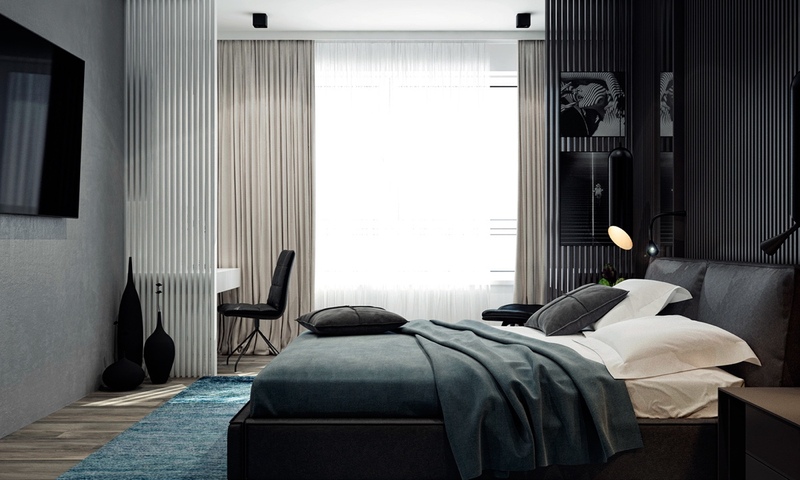 The bedroom adds green as its signature, as black and white symphonies tie them together. A black corrugated feature wall sits amidst mirrored panels, elongating the space. A twin corrugated partition in white shows light through a wide-paned window, while green stretches over covers and a rug. 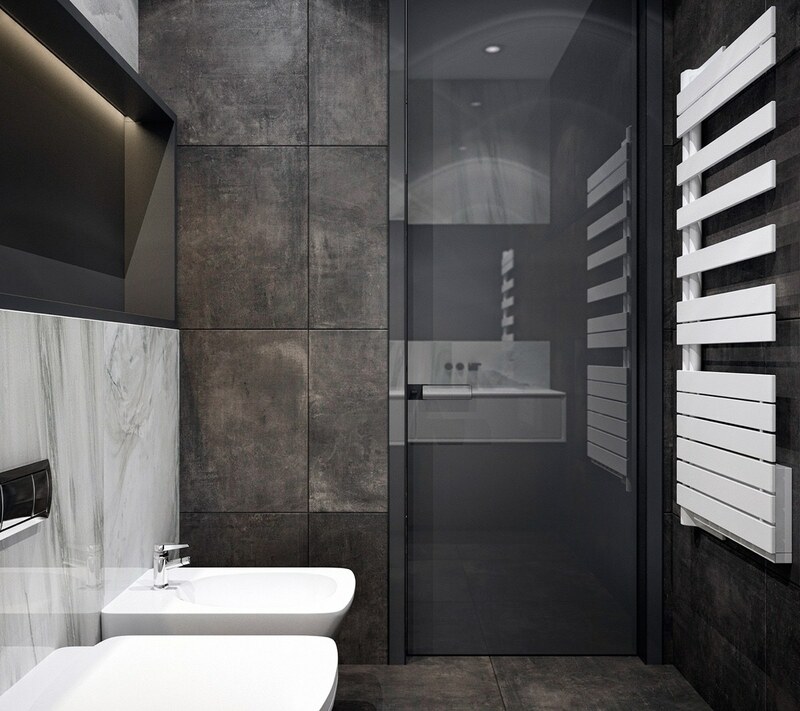 Black cylindrical lights add a finishing touch. The kid’s bedroom becomes more playful. 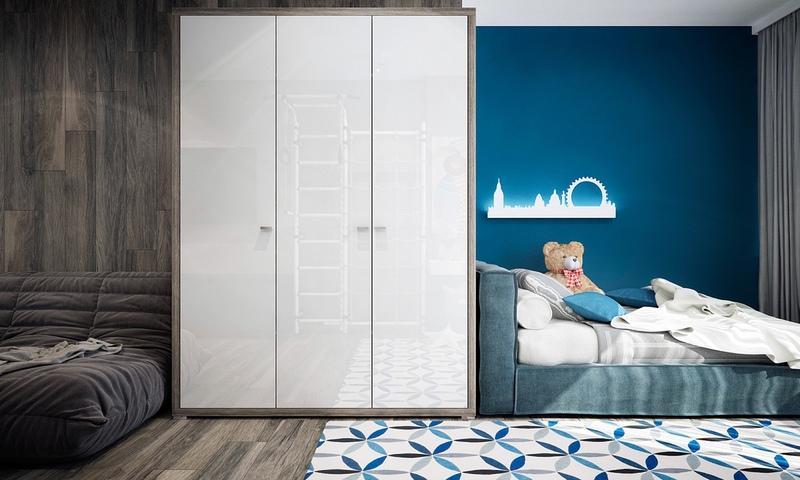 White lacquered cupboards oppose white ladders, a place for kids to climb inside. A kaleidoscopic owl painting, multi-coloured hexagonal rug, and turquoise toy box make it fun. Around the corner, dreamtime is held in another bright turquoise space, complete with white skyline decal. 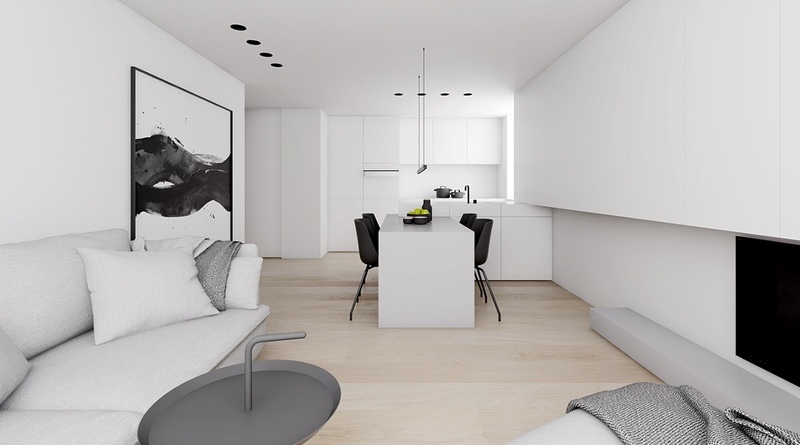 White walls and wooden floors retain the minimal. 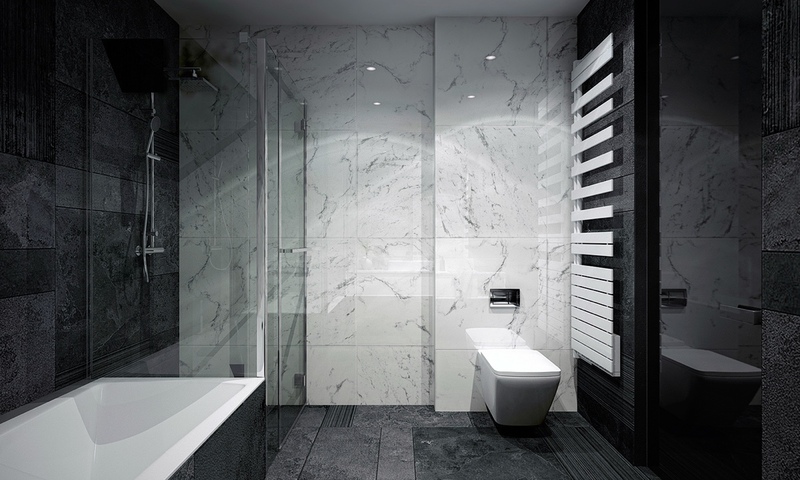 Greys, whites and blacks shine again in wide marble tiles with aspects of each. 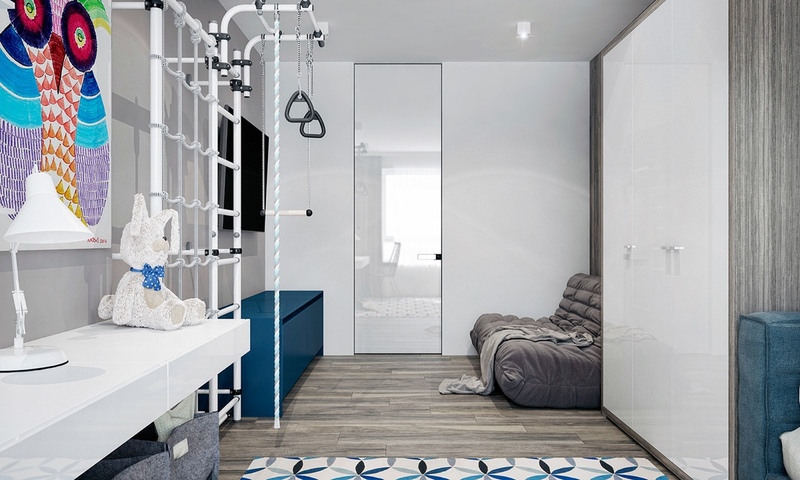 Mirrors form the space between, reflecting and enlarging the space. 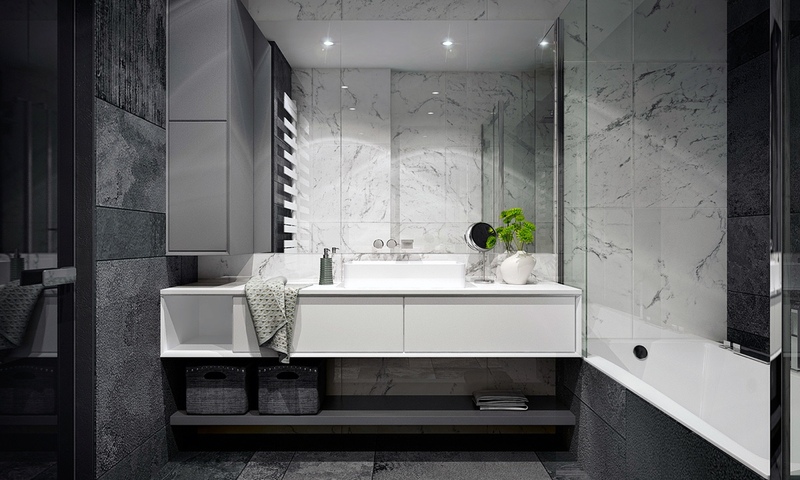 White lacquered cabinets hang beside porcelain and a white towel rail. Sprigs of life in round white vases add colour. 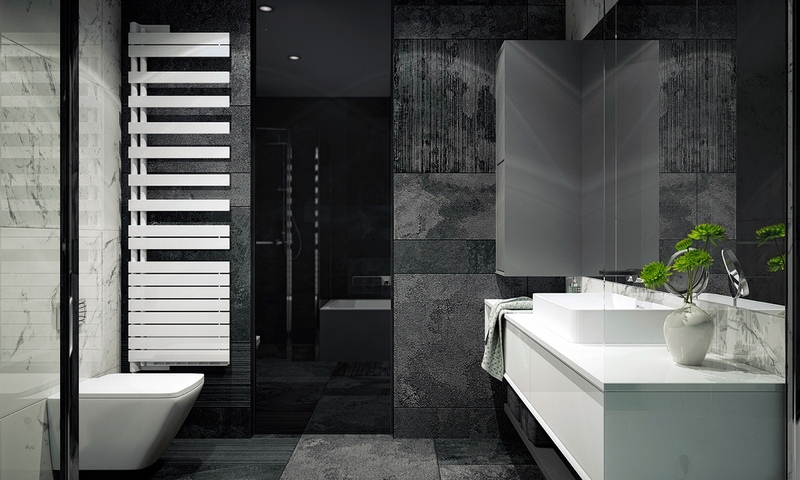 Grey panelled shower doors act as another mirror, reflecting light and keeping contents mysterious. 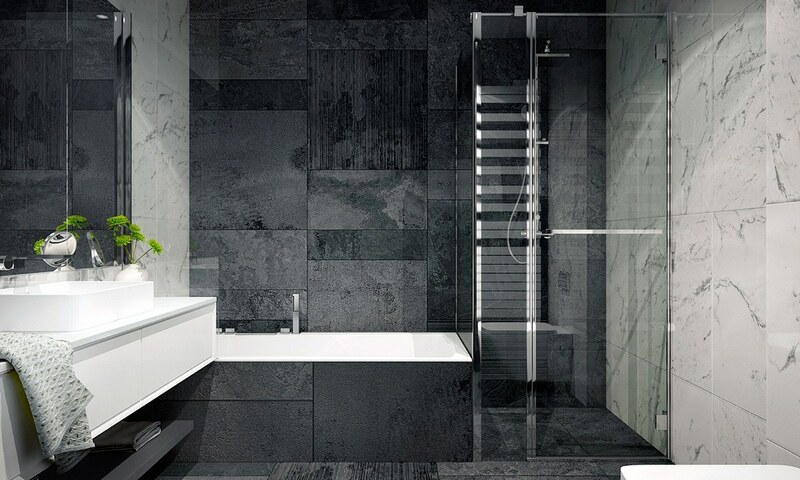 A bath invites, swathed in charcoal tiling, a perfect space to relax and recline.